It is not the case that we can live long in places without them becoming part of us and we becoming part of them. I am not here talking about countries or cities, but the quarters in which we live and to which we return daily to satisfy our most basic needs. Our spaces shape our thoughts and feelings, and we in turn, leave ourselves behind in them. In the context of our separate barricades, in these modern day caves, our memories are made and stored in the very walls themselves. In a dialectic of mutual interpenetration, atoms are interchanged between flesh and substance, our sounds never fully dissipated, permeate the very structure of matter and are recorded there. The fluids from our bodies leave their marks on cloth and paper, walls and wood, and the smallest particles of things enter into us. We leave the record of our lives in the spaces we have lived, and they are there to be read and felt by those sensitive enough to feel ghosts. If you are absolutely quiet and still, and bring your fingers close to the wall, let them float above it without actual contact, and put your ear to it just so, as if at the entrance to a sea shell, the remembrances of things past will come to you. It was sweet with memories, and ghosts of people and times past, and newer ghosts from my own life, which wandered from room to room with me. I had moved in after I had sold my house, a house which I myself had bought; I, the single mother of three daughters. Buying it was the symbol of my ability not merely to survive but to endure in the hard land of America. I had lived there for almost fifteen years before I moved into the apartment. Both had been built in the 1920s when the small village on the banks of the Hackensack River, was a vacation resort for people from the City, and the memories of those times were recorded in ancient woods and dead plaster and floors that moved beneath one’s feet. The past whispered in the night as the house let go its ghosts. I left my homes, and my land, and the sweet memories behind when I set off for Moscow. I arrived in Moscow on September 3rd, 2008. I had packed up what I had deemed clothing most necessary for a stay in Russia: heavy boots, coats, hats, scarves and sweaters, lots and lots of sweaters. The suitcases were heavy. I had expected a man to meet me. Instead a small frail woman greeted me and together we struggled to move my oversized suitcases out to her car and load them in. It was a hard job, and at the end, my white slacks and blue blazer were filthy. I took the ludicrous struggle and its consequences as an omen of things to come. We drove through the enchanting birch forests that ran along the highway and I felt myself surrounded by the heart of Russia…for not Moscow, nor St. Petersburg, nor any of the great churches or buildings, but, as any Russian will tell you, birches are the heart of Russia. When we entered the outskirts of the city and I saw the huge stacks spewing forth clouds of yellow tinged gases, I wondered why in my right mind I had ever decided to come to Moscow. Finally, we arrived at an aged sixteen story building, one of a multitude of nearly identical closely packed buildings that stretched unto the horizon line of my vision. No quaint churches, no onion roofs, just these tall and uniform buildings washed in gray. As I came to understand later, they were both the symbol of the great Soviet need to provide housing for the people, and of the efficacy with which it was able to fulfill that need. The housing inherited by the revolutionaries had been dismally inadequate. Before WWI, in Moscow and St. Petersburg living quarters were not only crowded they were often without water and amenities. Moscow was notorious for its bunk system, and in St. Petersburg two-thirds of all workers had only a bunk or a corner of a room to live in. Among families every second family had less than half a room. However, even as efforts were made to improve housing during this time, industry continued to grow faster than housing so available housing space fell continuously. In the 20 years following the Revolution, while millions of square meters of new living space were built, enough to house 12 million new urban dwellers at the modest standard of 6.5 sq. meters per person, industrialization and collectivization had swollen the urban working class two and a half times faster than living space for them was being built. World Wars I and II only exacerbated the situation, and plentiful and adequate housing for the masses remained one of the chief problems the Soviet Union had to grapple with. 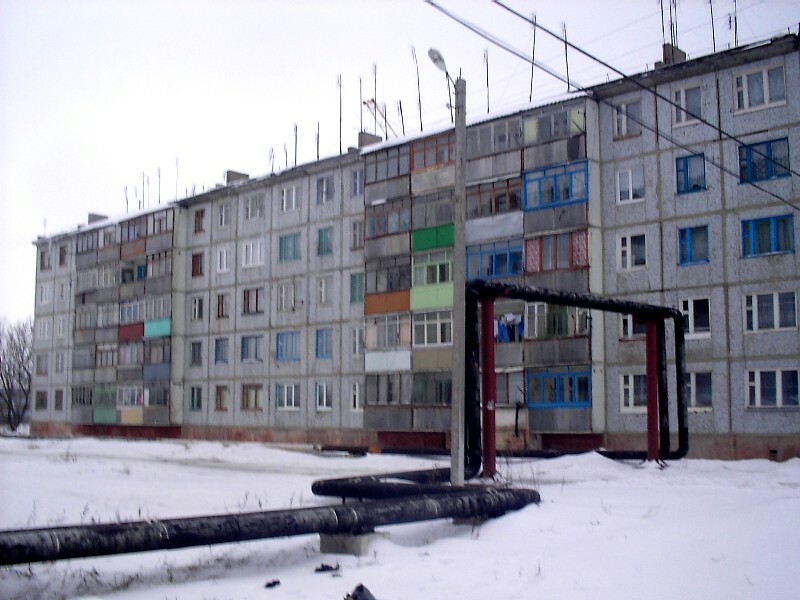 While Stalin built great and noble buildings, it was not until the end of the 1950s, under Khrushchev that the largest program of industrialized housing in history was begun. Made of prefabbed concrete panels or else bricks, huge numbers of these homes four or five story buildings began to be erected. They were sometimes referred to as “Khruschoba” or Khrushchev slums. But to the families who finally had apartments of their own, they were miracles. I remember watching a film at the Multimedia Art Museum in Moscow, of a family first entering their Khruschoba. The woman bent over a small simple sink, turned the water on, held her hand underneath and stood there weeping with joy. Later on, the buildings were higher and had elevators. It was before one of these that I found myself standing that first day. A gray scarred steel door opened when a code was punched in. Once inside I was confronted with filthy tiles, the faint but steady odor of garbage drifting from the shute, and rows of mailboxes some hanging off the wall. There was graffiti on the elevator, and strips of glass still hung from the shattered mirror. When I complained to the young woman about the state of the building, she simply ignored me We took the filthy elevator to the 9th floor and faced another thick steel door at the right of the elevator. When we passed through that we faced yet another steel door just slightly to the left of it. This was opened with an ancient, long handled key, that did not fit very well and so required some jiggling to work. Then, at last, I stood in front of the entrance to my apartment. I don’t know what it was made of, but it was covered with a padded leather like fabric. I never understood and I still do not understand, why the door was padded; but doors to apartments are padded in Moscow. I remember, will never forget, that there was a small icon pressed behind a pipe above my door. I took it as an omen. When she left, I looked around and found myself back in the USSR where, save for minor details, one apartment looked very much like another. Soviet apartments start with a corridor with hooks on the walls for coats, and shoe racks below them. The shoe racks are particularly important because people immediately take off their shoes when they pass through the door. When guests remove their shoes, the host is expected to give them sandals to wear in the house. It is a great, perhaps the greatest, faux pa not to take your shoes off and put sandals on. The bathroom is off this corridor. My toilet and tub were in one room, but very often, the toilet and tub are in separate rooms, with the sink in the same room as the tub. There was also a small washing machine in the bathroom. I was quite impressed with that as I had never had a washing machine in an apartment and instead had to go to a common wash area to wash my clothes in unsanitary machines with lukewarm water and short cycles. Most importantly, I did not have to push endless numbers of coins into the machine. The kitchen was at the end of the short corridor and was small, perhaps four or five square meters. There was one padded, backless stool next to an old formica table. But there was a huge window from which I could see a small strip of park that separated one section of the gray buildings from the other. The main room was about 20 square meters. Off one end, and much to my delight, was a wood paneled balcony. There was a “modern” looking couch and chair from the late 50s. Soviet books still sat on the pressboard and veneer wall that ran the length of the living room. In every Soviet apartment it was the primary storage unit of the household, which has no closets. On one wall there hung, as in most apartments from that time, a “Persian” carpet. Below that was a single bed with a straw mattress. As I would learn, the carpet was there not only to insulate the room but also as a “status symbol” as carpets were somewhat expensive in Soviet times. The living room light had had its glass shade broken years ago, and everywhere, where the wallpaper peeled from the walls, it had been patched with pieces of other nonmatching wallpapers. During Soviet times, several people would have slept in this room, and perhaps another in the kitchen or foyer.